Ré Soupault, Autoportrait à Buenos Aires, 1944. 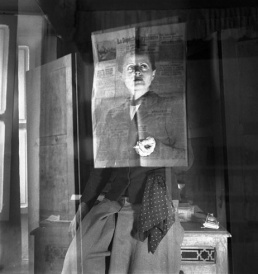 Ré Soupault, Autoportrait à Tunis, 1939. The photographer Ré Soupault (Renee Meyer, Renate Green, Erna Richter) was at the heart of classical Modernism in both Berlin and Paris. Born Meta Erna Niemeyer in Bublitz, Pomerania, in 1901, Ré Soupault was one of the most important female photographers of the 20th century. After training at the Bauhaus in Weimar (1921-1925) under Johannes Itten, Wassily Kandinsky, Georg Muche, Oskar Schlemmer, Paul Klee and others, she became part of the European avant-garde movements of the 1920s and 1930s. In 1923-24 she worked with the avant-garde film-maker Viking Eggeling on his film Diagonal Symphony. In 1925 she made the acquaintance of Man Ray and Fernand Léger in Paris. She left Weimar for good in 1925 and worked as a fashion journalist for the periodicals Silberspiegel and Sport im Bild published by Berlin's Scherl-Verlag, for which she was also active as a correspondent in Paris. In 1926 she married Hans Richter. Their flat in Berlin's Trabenerstrasse became a meeting place for the international avant-garde. In 1928, after her journalistic work for Scherl-Verlag, she set up the fashion studio "Ré Sport" in Paris, which she ran until 1934. She designed prêt-à-porter, made clothes for Bohemian society women in Paris and worked closely with Man Ray, who photographed her spring and autumn collections. In 1933 she met a co-founder of the Surrealism movement, Philippe Soupault, who had collaborated with André Breton on The Magnetic Fields and whom she married in 1936. In Paris she belonged to the circle of artists around Man Ray, Fernand Léger, Florence Henri, Gisèle Freund, Elsa Triolet, Helen Hessel, Max Ernst, Henryk Berlewi, Kiki, Foujita, Sonia and Robert Delaunay, André Kertesz, and Alberto Giacometti. Philippe Soupault had been one of the leading French journalists since the end of the 1920s and worked for VU, Excelsior and L'Intransigeant, among others. He persuaded Ré to illustrate his pieces. Ré Soupault's photographic work covers the period between 1934 and 1952, during which time she travelled to Germany, France, Italy, Spain, Sweden, Norway, Finland, the U.S.A. and Tunisia. From the very start she used a 6x6 and 4x4 Rolleiflex camera and a Leica. 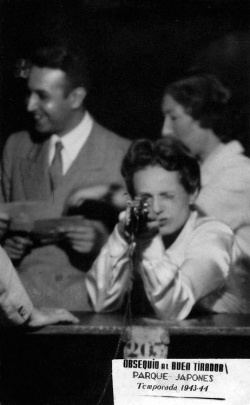 Following her escape from Tunis and a four-year sojourn in North, Central and South America, Ré Soupault settled in Basle in 1948. There she worked as a translator (for Romain Rolland, Lautréamont, Tristan Tzara and others) and studied under Karl Jaspers. From the mid-1950s the artist again lived in Paris, where she worked until her death in 1996 as a translator, writer, film-maker, author of radio plays and essays, and publisher of fairy tale anthologies.